Friedrich Nietzsche has always been recognized as an original thinker, one who stands apart from and outside the philosophical schools and tendencies of his time. This is the way he continually presented himself. Many readers have accepted this self-interpretation at face value. Yet there is another side to Nietzsche's thinking which shows not only an awareness of contemporary writers, but an engagement with their ideas which is often both intense and sustained. The intention of this study is to explore this side in detail, by surveying various themes in his philosophical thinking with such links in mind. It is important to avoid one misunderstanding though* this book is not designed to show that Nietzsche derived his ideas from various other thinkers. In that sense, it is not necessarily about sources or even about influences. Rather, it shows that his independence and originality developed in dialogue with other thinkers. Those qualities are no less real for that reason; in fact the author believes that they can be appreciated all the more by being placed in the context of his relations to other philosophers. 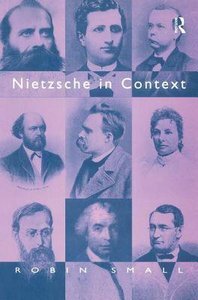 - Publisher Nietzsche in Context presents a comprehensive reinterpretation of Nietzsche's thought, placing Nietzsche in the context of the philosophers of his own time. Offering a survey of important philosophical themes, Robin Small identifies the writer or writers with whom Nietzsche most felt himself to be engaging in dialogue. This historical dimension is complemented by original analysis and interpretation of the ideas under discussion.Nietzsche in Context takes Nietzsche scholarship into new and fruitful directions. By locating his ideas within a broader context, this book provides a comprehensive reinterpretation of Nietzsche's thought adding to the continuing interest of his contributions to philosophy. Nietzsche in Context presents a comprehensive reinterpretation of Nietzsche's thought, placing Nietzsche in the context of the philosophers of his own time. Offering a survey of important philosophical themes, Robin Small identifies the writer or writers with whom Nietzsche most felt himself to be engaging in dialogue. This historical dimension is complemented by original analysis and interpretation of the ideas under discussion.Nietzsche in Context takes Nietzsche scholarship into new and fruitful directions. By locating his ideas within a broader context, this book provides a comprehensive reinterpretation of Nietzsche's thought adding to the continuing interest of his contributions to philosophy. Senior Lecturer in Television, Media Department, University of Huddersfield. Runs production safety courses for the Independent TV Training Association.